A voucher deal came up recently for the cafe across the road from Liam's work which was too good to pass up! 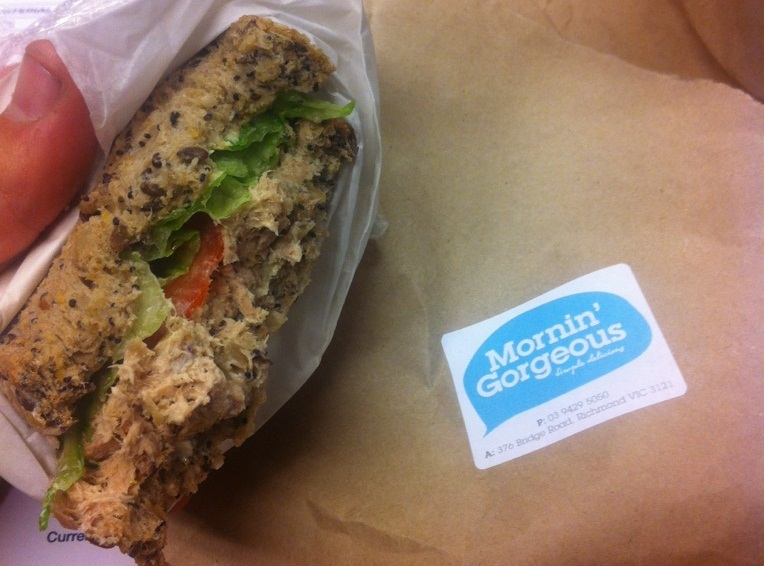 $7 buys a bagel of your choice and a smoothie juice from their bottled selection. I LOVE a good bagel, so as soon as this deal came up I knew I had to have it! We bought two vouchers, one for Liam to have at lunchtime during work and the other for him to bring home for me to feast on. With the vouchers, we each decided to get the cream cheese and smoked salmon bagel, with salad leaves, cucumber, red onion and lemon capers. The first thing I noticed when I unwrapped this bagel were the luscious chunks of salmon nestled inside. This is not your ordinary supermarket-bought smoked salmon, no ma'am! The pieces were about three times as thick as the oily slices you'll usually find vacuum-packed in the shops. They were lovely and flaky, unlike any other that I have had before. Liam also had a chat with the owners when he went back to pick up my bagel. One of them was so excited to hear that he was taking it home for me to try, and upon finding out that I was a bagel fiend told Liam that she really hoped I liked it! She told him that she actually made the bagels herself, so she'd love to know my verdict. Well, here it is - a delicious dense chewy bagel, with a lovely crunch of salads, a generous smear of cream cheese and gorgeous lemon capers which burst with flavour in your mouth! Although I have not visited the cafe myself, I can tell the service is friendly and welcoming. That combined with the lovely quality food, I would highly recommend you visit if you're in the area! Testament to that is that Liam has already re-visited twice since then to sample some of their offerings. I love bagels so much!! I get mine from Johnston St and just have it plain with cream cheese or with butter. Mmmmmm need bagel this weekend! YUM. Sometimes when I'm just doing simple bagels at home I use smoked salmon cream cheese. SO tasty! Oh, you should give them a shot! They're divine with just a bit of cream cheese, smoked salmon and capers! ooo I've never had a savory bagel before! Do it! Haha. I think I've said smoked salmon too many times in this post alone, but they're seriously an awesome combination!